Santigie Koroma searches the faces of other Ebola survivors in the room for a “father”. His real father is dead. Then his gaze lights on Hassan Santuray. The two leave the room with another survivor who is playing the ambulance attendant, and then return “in character”. Santigie supports and half carries Hassan into the room to a chair across from the “triage nurse,” played by another survivor. Santigie’s “father” collapses, nearly unconscious, into a tiny chair, borrowed from a nearby classroom. Santigie steadies him and answers questions from the triage nurse, ticking through the familiar list of Ebola symptoms. Santigie, Hassan and the others in the room are a new breed of expert. Not only have they survived Ebola virus disease, they are now using what they learned while fighting the disease to teach frontline Ebola care workers what managing someone with Ebola is really like. Working with them is 58 year-old Benon Tumwebaze, a WHO teacher from Uganda. For 7 weeks, Tumbwebaze gently guided Ebola survivors in Liberia to be “expert patients” giving them a special mandate: to teach health workers how to be safe, and most importantly how to care for Ebola patients. Now he is in Sierra Leone, at a soon-to-be finished Ebola Treatment Centre in Waterloo, near Freetown, to guide this new group of survivors as they become “expert patients”. Hassan’s serious face is transformed by a wide grin. 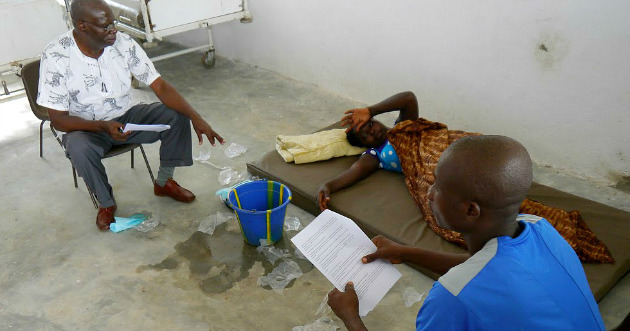 His younger brother, father and sister-in-law died of Ebola. Three other brothers and his uncle sit here in the circle taking turns to play patient roles and give each other feedback. Like everyone in this unique team, they are quick to smile and deeply supportive of their peers. Most in this group went through their illness and survived together, receiving their discharge certificates from the Hastings Ebola Treatment Centre in Freetown last month. They share how they were infected with Ebola, talk about those who died, and recall their symptoms in great detail. Like any good actor, they must draw on those difficult memories to play their roles in this real life-and-death drama. With new numbers of people sick with Ebola continuing to outstrip the number of beds available to care for them, WHO trainers like Tumwebaze are racing to train health workers to safely work in each new centre. WHO training experts have worked with Sierra Leone Ministry of Health nurse trainers to train more than 1000 health care workers in Ebola virus disease care and infection prevention over the past few months. These efforts are increasing every week.